A dog owner tells her Pembrokeshire Welsh Corgi to 'stay' as four Corgi dogs pose next to wax work models of the British Royal family wearing colorful Christmas themed jumpers for a charity Christmas Jumper Day campaign at Madame Tussauds wax works in London, Tuesday, Dec. 6, 2016. The members of the royal family are from the left, Prince Charles Camilla, Duchess of Cornwall, Prince Phillip, Queen Elizabeth II, Kate, Duchess of Cambridge, Prince William, and Prince Harry. The Queen is well known for her love of this particular breed of dogs. Even a family as regal as the British Royals is not exempt from humiliating holiday traditions. 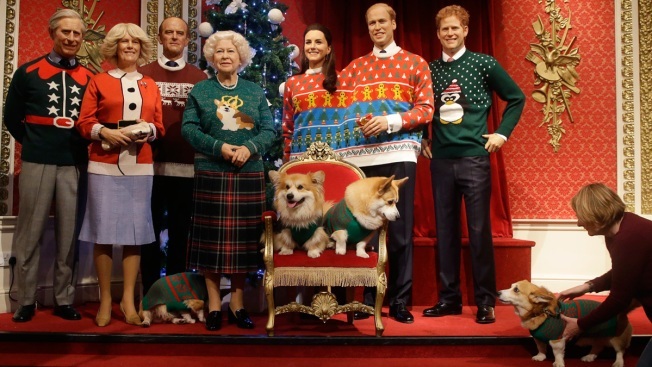 Madame Tussauds London has outfitted the royal family's wax figures with ugly Christmas sweaters. The Duke and Duchess of Cambridge are wearing a conjoined couples' sweater and Queen Elizabeth is donning a corgi-themed sweater. Four real corgi dogs were present for the official photo shoot as an homage to the queens’ own famous corgis. The sweaters, according to the museum's Instagram, were designed in aid of Christmas Jumper Day 2016. The U.K. holiday, sponsored by the global charity organization Save the Children, is an annual fundraising campaign dedicated to giving back to children in need. This year, it will be celebrated on Dec. 16. According to the organization's website, participants are asked to get together with anyone, from their teachers to their butchers, to dress in festive, holiday garb and to donate to the charity.